NIGHTSEA was founded by Charles Mazel, PhD, and Ross Kniffin. Our roots are in exploration and photography of fluorescence underwater. Charlie started out as a sport diver. 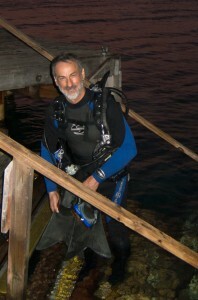 He developed the equipment and techniques for searching for and photographing fluorescence underwater purely as a hobby (i.e., passion/obsession). All the early diving and experimenting was in the cold waters of Massachusetts. Once he had a working system it was time to head to the Caribbean. Charlie came back from his trip to Roatan, Honduras, with his first collection of comparative white-light and fluorescence images of corals and anemones and sought out a marine biologist to tell him what he was seeing. It was only then that he learned that very little was known about the fluorescence of corals. This led him back to school, where he earned his PhD in Marine Biology at Boston University under the excellent guidance of Drs. Charles Yentsch, Les Kaufman, Jella Atema, and others. This led to a new direction in research on optical properties of seafloor organisms, and participation in a number of research projects sponsored by the Office of Naval Research. This work also provided the opportunity for the first-ever explorations for deep-sea fluorescence using the Harbor Branch Oceanographic Institution’s Johnson Sea-Link manned submersible. When the time felt right to establish NIGHTSEA to share the equipment he had developed for his own research with the diving community in general, Charlie looked to his good friend Ross Kniffin for guidance and support. Ross had been a commercial diver, retail dive shop owner, and dive travel leader, and brought with him a deep (no pun intended) knowledge of the diving industry that has proved invaluable. With the discovery that the fluorescent proteins in corals were a form of the magical green fluorescent protein originally found in jellyfish it was a natural transition to supply variants of our underwater lights and viewing equipment to the biotechnology research community. We continue to explore fluorescence in the world around us and provide practical tools that enable scientists, students, sport divers. professional photographers/videographers, and others to explore this hidden spectral realm.